One young lady answered my appeal for the misssing Brunei stamps. By today I will get a used set. I am still waiting for my mint set. So if there are mint sets out there, please let me know. She wanted to know more about one particular stamp a 15c 1947 definitive. So I thought I will highlight the entire 1947 set. The 1947 set was produced after the Japanese occupation. So all Japanese stamps were to be replaced with an entirely new set of colour. The entire mint set would set you back around $200 catalog value making it affordable to most collectors. There are some high values, the $10 stamp is worth $140 singly, the $5 stamp is worth around $36 and the $1 stamp is worth around $18. But if you can get your hands on a 1c stamp where the A of the watermark CA is missisang its A is worth around $2,500.00. The 5c retouch if you can get it is worth around $275 each. The sky retouch on 2c stamp would be worth around $150. I guess this is a celebration of sorts. I managed to purchase the Brunei's 1908 $5 stamp (right). A few months ago, I managed to purchase the Brunei's 1908 $5 stamp (left) but it was flawed. So I had to wait for a new one to come on the market and finally it did. It cost me $82 when I won it. It is worth it as the catalogue value is US$175. 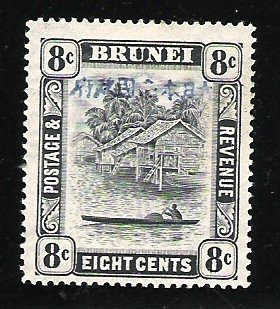 This stamp was part of the second set of the Brunei series. This was issued in 1908, exactly 100 years ago. The stamps are used both for fiscal and revenue as well as pay for postage. 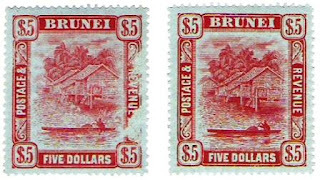 It will be in 1947 before the Brunei Postal Authorities issued another $5 stamp. This is my latest acquisition - a very rare 8 cent stamps overprinted by the Japanese Imperial Government for use in Brunei during the Second World War. The 8 cents stamp even without overprints are rare as not many were produced. This one cost me US$230 which makes it the most expensive among my 15 Brunei overprint Japan stamps. 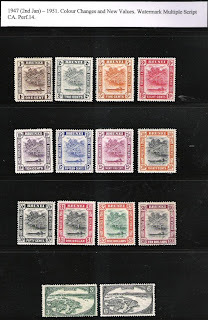 I thought I had completed my series but there are sill 5 stamps which I still need to collect. The catalogue value for this stamp is US$760, so the US$230 I paid for is worth it. The other expensive values will be the $5, $25 and $3 overprints. I am trying to get the 16th stamp which is the 30 cents overprint. Luckily that only has a CV value of US$105 but I probably have to pay much higher than that. It's the 2008 Olympics in Beijing today. 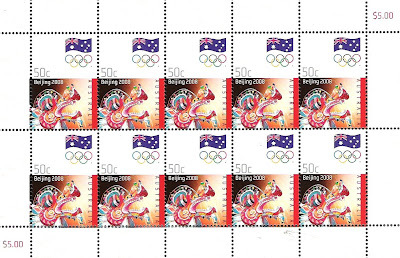 Today's illustration is the Olympics stamps issued by Australia given by a fellow collector friend, Kai from Australia. When did the Olympics start? According to legend, the ancient Olympic Games were founded by Heracles (the Roman Hercules), a son of Zeus. Yet the first Olympic Games for which we still have written records were held in 776 BCE. At this Olympic Games, a naked runner, won the sole event at the Olympics, the stade - a run of approximately 192 meters (210 yards) making him the very first Olympic champion in history. The ancient Olympic Games grew and continued to be played every four years for nearly 1200 years. In 393 CE, the Roman emperor Theodosius I, a Christian, abolished the Games because of their pagan influences. It took almost 1,500 before a Frenchmen named Pierre de Coubertin began its revival. He believed that the French lost to the Germans not because of military tactics but because they were weak. So Coubertin decided that it was exercise, more specifically sports, that made a well-rounded and vigorous person. It took him a while to get France interested. In 1890, he organized and founded a sports organization, Union des Sociétés Francaises de Sports Athlétiques (USFSA). After one failure, four years later, Coubertin organized another meeting. This time with 79 delegates who represented nine countries. He gathered these delegates in an auditorium that was decorated by neoclassical murals and similar additional points of ambiance. At this meeting, Coubertin eloquently spoke of the revival of the Olympic Games. The delegates at the conference voted unanimously for the Olympic Games. The delegates also decided to have Coubertin construct an international committee to organize the Games. This committee became the International Olympic Committee and Demetrious Vikelas from Greece was selected to be its first president. Athens was chosen for the revival of the Olympic Games and the planning was begun. The very first modern Olympic Games opened in the first week of April 1896. Since the Greek government had been unable to fund construction of a stadium, a wealthy Greek architect, Georgios Averoff, donated one million drachmas (over $100,000) to restore the Panathenaic Stadium, originally built in 330 BCE, with white marble for the Olympic Games. Since the Games were not well publicized internationally, contestants were not nationally chosen but rather came individually and at their own expense. Some contestants were tourists who happened to be in the area during the Games. Athletes wore their athletic club uniform rather than a national team one. Last Friday was 1st August 2008. 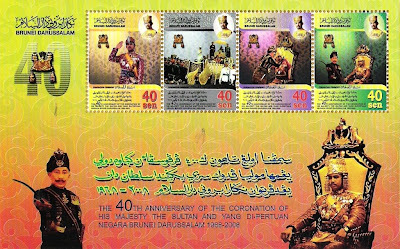 It was 40 years ago when His Majesty Sultan Haji Hassanal Bolkiah was coronated as the 29th Sultan of Brunei, a long line of Sultanate which started in the 14th Century. However according to Chinese records, friendly exchanges between Brunei and China have a long history. The earliest records date back more than 2,000 years ago as early as the Western Han Dynasty (206 BC to 23 AD) when commodity trade relations existed and official exchanges between the governments during the Tang Dynasty (618 AD to 907 AD). By the time of the Song Dynasty (960 AD to 1270 AD), there were official and non-governmental commercial and cultural exchanges have been officially recorded in the history of China. I got the information from a book called 'The Collection of Historical Documents Related to Bilateral Relations Between China and Brunei Darussalam' edited by Liu Xinsheng, published by World Affairs Press China in 2006. So if we were to take the lineage of the rulers of Brunei beyond the 13th century, then our rulers have been in existent and we as a country has certainly been in existence for a really really long time. Anyway, I digress. To mark His Majesty's 40th Coronation Anniversary, the Postal Services Department issued a special set of commemorative stamps. These stamps depict events from the coronation in itself. This is the 4th set of Coronation Anniversary Stamps. The previous ones were to celebrate the 10th Anniversary in 1978, the 20th Anniversary in 1988 and the 30th Anniversary in 1998. This year's stamps are also available on first day covers as well as on miniature sheets. When I went to the Philatelic Counter yesterday to get my order, I was told that there are two types of miniature sheets. One is the one that you can see here and the other is a $40 miniature sheet which the Postal Services had to return back because due to colour differences. That one will be released as soon as the printers come back with the corrected colours.